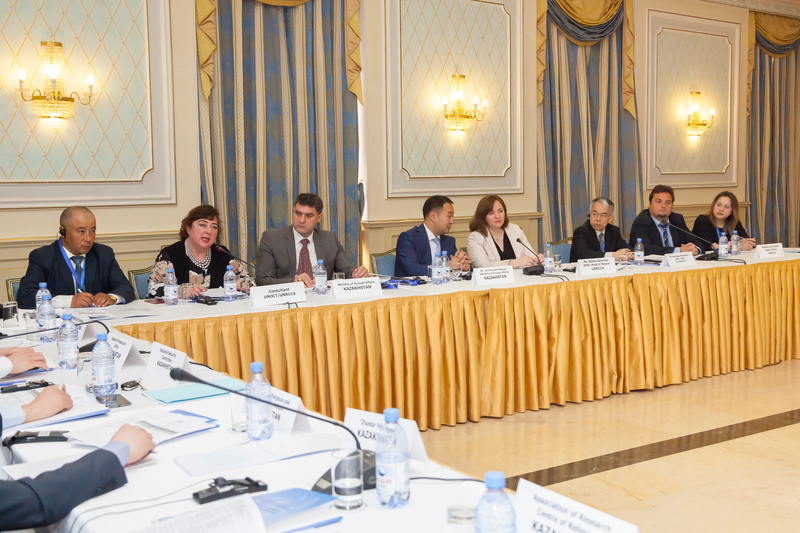 A regional workshop “Addressing Conditions Conducive to the Spread of Violent Extremism and Terrorism” was organized by the UN Regional Centre for Preventive Diplomacy for Central Asia (UNRCCA) and the UN Office of Counter Terrorism (UNOCT) in Astana, on 21-22 May 2018. Central Asian policy makers, practitioners, civil society organizations, experts and representatives of regional and international organizations came together to share experiences, strategies, best practices and challenges in addressing conditions conducive to the spread of violent extremism and terrorism in Central Asia. Over the two days, participants engaged in interactive discussions and gained exposure to a variety of policies and practices related to addressing conditions conducive to terrorism and violent extremism in line with Pillar 1 of the Joint Plan of Action on Implementing the UN Global Counter-Terrorism Strategy in Central Asia. They also had an opportunity to become better positioned to design holistic Preventive Violent Extremism (PVE) and Counter- Terrorism (CT) strategies and national action plan in compliance with United Nations standards. In her opening remarks, Special Representatives of the Secretary-General for Central Asia and Head of UNRCCA, Natalia Gherman encouraged Central Asian states to “review efforts made in addressing conditions conducive to the spread of terrorism and violent extremism and discuss drivers of theses phenomena in the region”. The event was organized within the regional project titled “Towards a comprehensive implementation of the United Nations Global Counter-Terrorism Strategy in Central Asia”. The latest phase of this joint UNRCCA - OCT initiative was newly launched in Ashgabat by Michèle Coninsx, Assistant Secretary-General and Executive Director of the Counter-Terrorism Committee Executive Directorate, Vladimir Voronkov, Under-Secretary-General of the United Nations Counter-Terrorism Office and Natalia Gherman, Special Representative of the UN Secretary-General for Central Asia, Head of UNRCCA. In June 2017, at a High-Level Dialogue on Counter-Terrorism chaired by the UN Secretary General in Ashgabat, CA states expressed their intent “to exert all necessary efforts to counter new threats identified in the fifth review resolution of the United Nations Counter-Terrorism Strategy, including the recommendations of the United Nations Plan of Action to Prevent Violent Extremism, through promoting dialogue and conflict prevention, addressing the foreign terrorist fighter phenomenon, promoting youth engagement, skills development and employment facilitation, countering terrorist narrative and the misuse of information technology, as well as sharing of information and best practices”.